The Grind Shop | Upcoming events! The Grind Shop or AZG is an awesome shop/skate park in Arizona. They have hosted some of the best ride days and competitions in the industry. The have two pretty cool events coming up that we just sort of wanted to highlight for everyone out there. Check them out below and make sure to attend if you're in the area. 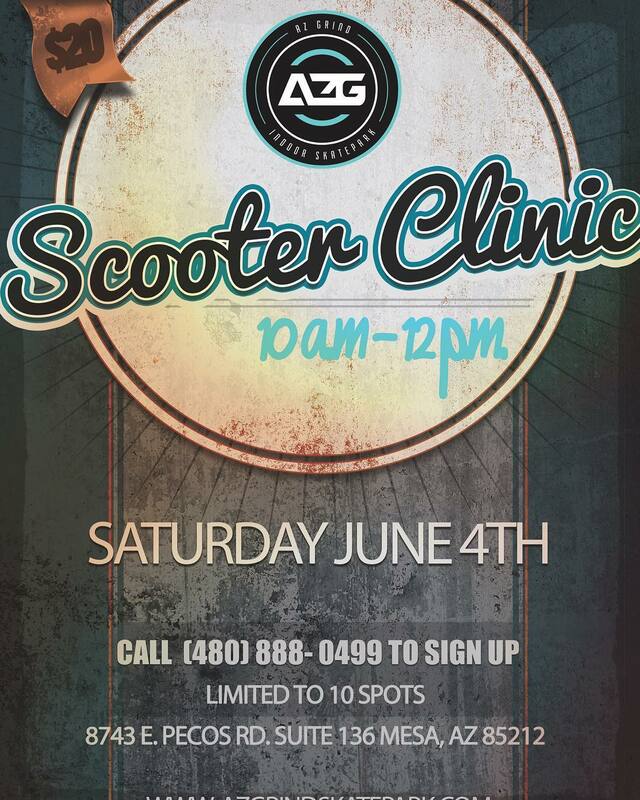 This scooter clinic takes place maybe once or twice a year. It is held from 10am – 12pm and it’s a time where kids are taught specific tricks they are looking to accomplish. This is not a typical scooter lesson as it 's more geared towards intermediate/advanced level riders. These clinics are limited to 10 kids only because AZG just has access to two instructors. This years pro instructors will be Jacob D’Arezzo and Austin Kuentz. 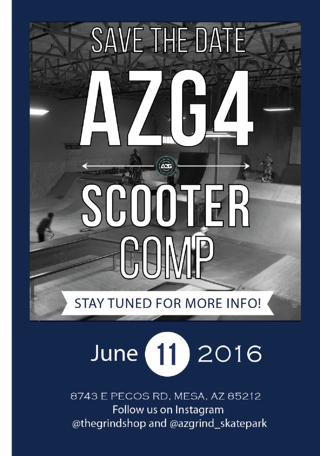 On this date, AZG will be holding its fourth scooter competition. The last three have been a huge success and I’m sure this one will be no different. There will be a product toss as well as some insane riding. Don’t miss out on the chance to ride AZGs amazing resi box alongside their foam pit. This should be an awesome day! So there you have it. Those are the next events coming up for AZ Grind. Both of these events will be awesome and if you’re in the area, you don’t want to miss any of them. You can check out AZ Grinds Instagram page HERE. Make sure to check out our Instagram page as well (HERE) to keep up to date.